There are not one, but two, aptly named Object Lessons—small loan shows—currently at the Timken Museum of Art in San Diego. 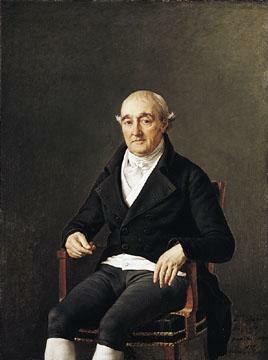 The first—France in the Golden Age—is up only until the 3rd June 2012 and the second, Goya’s Self-Portrait with Dr. Arrieta, continues until the 9th September. These are the result of the Timken’s still newish director, John Wilson, and his excellent museum-world connections and powers of negotiation. The Timken’s greatest painting—Rembrandt’s St. Bartholomew of c. 1657, perhaps the finest picture by the artist in the western half of the United States—has been lent to a major travelling exhibition and Dr. Wilson astutely asked from the borrowers the Cleveland Museum of Art and the Minneapolis Institute of Arts, a Nicolas Poussin and a Goya respectively. 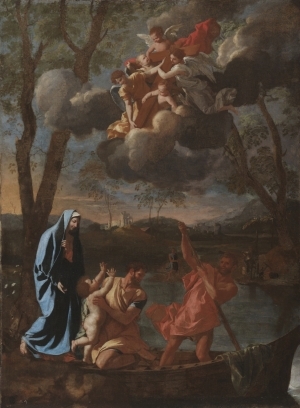 In a very clever move, the Timken has created a small exhibition of 17th-century French paintings around the Cleveland Poussin Holy Family Returns to Nazareth, from San Diego collections, most notably the Timken’s own. The object lesson here is that the Timken’s collection can more than hold its own with the major U.S. art museums in terms of quality, if not quantity. The Poussin from Cleveland (see left) is a welcome addition to San Diego as there are no other examples by that artist there. He is the foundation, as it were, of French Baroque art. That said, there are greater paintings by the artist in the Getty Museum and the Norton Simon Museum. Despite its condition (the somewhat worn surface of the picture), it is an interesting example of Poussin’s earlier style, with rather exceptional ex-Scriptural narrative cast in the guise of an ancient Roman sculptural relief. The story of the return of Mary, Joseph and the Christ Child to their hometown of Nazareth is almost completely absent from art, but here ties into earlier representations of the Holy Family escaping King Herod’s persecution to Egypt and their subsequent return to Israel. Poussin, ever the amateur archaeologist/classics scholar, depicts them after the Antique, with the ferryman who steers them across the water a veritable pagan Charon navigating the River Styx. What a comparison! The cleverness of the Timken display is not borrowing a Poussin, but creating a small contextual exhibition around it, with the superb Vouet Aeneas and his Father Fleeing Troy from the San Diego Museum of Art coming across the street to the Timken and the incomparably beautiful Christ Healing the Blind by Philippe de Champaigne (see below) from the Timken’s own collection. 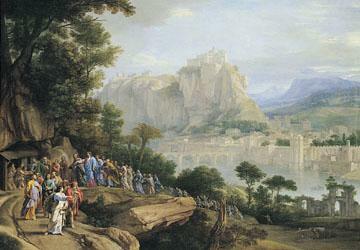 Rounding it out is another Timken picture, their lovely if not pristine (in condition) Claude Lorrain landscape. In one fell swoop, one can compare the major trends in different genres in 17th-century French painting, both in Rome (the classically inclined Poussin and Claude were ex-pats) and Paris (Vouet in his earlier years in Rome a follower of the towering realist Caravaggio). The great wow-factor at the Timken is, however, the coup of obtaining Francisco Jose de Goya y Lucientes ‘s Self-Portrait with Dr. Arrieta of 1820 from the Minneapolis Institute of Arts (see top right). It is a sublime masterpiece, and it is paired for the second Object Lesson with the Timken’s great 1802 portrait of Cooper Penrose by Jacques-Louis David (see top left). There is no finer work by the relatively rare David in the United States, at least outside a major East Coast museum. And the Goya is its perfect counter-balance. The David portrait is of a rich Irish businessman with republican sympathies painted close to David’s earlier “Revolutionary” m ode. This is a crisp style that vividly distills reportage of current events with classical world overtones. With it, the artist helped bring down the French monarchy, only to become around the time of the Timken portrait Napoleon’s chief propaganda producer. Two years later the dictator would crown himself emperor of the French and commission David to produce a gigantic depiction of his coronation, finished in 1807. The Penrose portrait exudes—if it exudes at all—cool rationality and measured deliberateness. The Goya double-portrait is completely the opposite, painted in Goya’s signature late style—painterly brushwork, somber palette and dark subject. Here we see the artist in extremis, being treated by his faithful doctor. The composition is modeled after a pietà (the dead Christ cradled by his mother) or a suffering, swooning Christ at Gethsemane, supported by an angel. Following the format of an ex-voto (a work given in thanks to God) the artist thanks in the inscription at the bottom edge his friend Arrieta for saving his life. This is obviously highly significant for a man who built a career on Enlightenment views, lambasting the clergy and established religion. 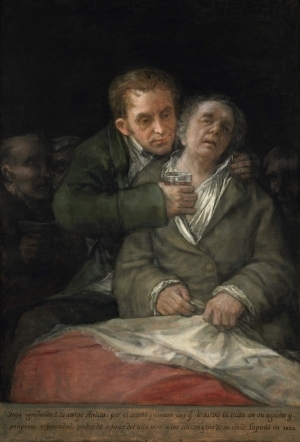 Given this, the allusion of the doctor to a comforting mother or angel and the artist’s identification with Christ as Man of Sorrows is both mysterious and compelling; especially by an artist facing mortality (Goya would finally die eight years later). These two portraits—separated by only 18 years—are a brilliant juxtaposition of the Neo-classical with the Romantic, the pragmatic with the pessimistic, the earthly with the spiritual. They are worlds apart, but can be seen together for three more months—and perhaps never again—at the Timken Museum of Art.